Please note: we are no longer promoting this resource. 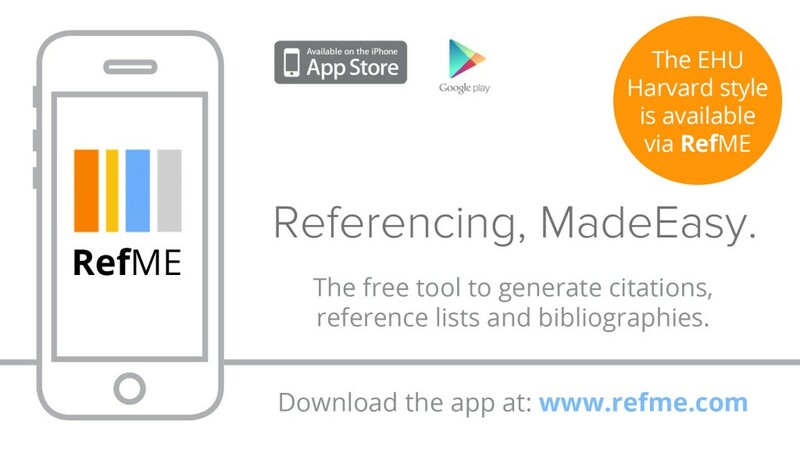 Compiling a bibliography can be a daunting prospect – one way to help you get the hang of what’s required is to download the Reference Me app (RefME). It captures the citations of the resources you have used and will create a bibliography for you. Now create an account and then you’re ready to start. To create a reference, hold your device over the barcode of a book or journal article, your device camera takes an image shot of the barcode (see image below) and then generates the reference as it would appear within a bibliography. You are given the option to add a citation and to do this you simply add the page number (s) and the citation will appear! One added bonus is that the app now includes the new Edge Hill Harvard style for you to use. Try the app out and if you have any questions please see staff at the AskDesk in the University Library, Aintree or Woodlands. Come along to the session on Monday 26 March if you would like help with using Harvard referencing in your assignments. This is one of a series of sessions called Steps to Success which have been designed to help you to improve your academic skills. You can find out how to reference some commonly used (and some less commonly used!) sources in your assignments including books, journals, reports and websites and you can also learn more about different ways to reference by using direct quotations and paraphrasing. If you’re still getting to grips with using Harvard referencing, come along to the session on Tuesday 20 March as part of the Steps to Success series which has been designed to help you to improve your academic skills. If you’re still getting to grips with using Harvard referencing, you may like to know that there is a new guide to Harvard Referencing which may help. The new guide is a revised version of the existing document but is now easier to read and has been updated with more contemporary examples. It will demonstrate how to reference the more commonly used sources in your assignments, such as books, journals and websites and will also provide you with explanations about the different ways to reference such as using direct quotations and paraphrasing. Don’t worry though if you’re using (or even continue to use) the previous guide issued in September 2011; the new guide does not change any of the principles or conventions for referencing, we just think it is a better format for helping you to navigate the rules of referencing. Learning Services is offering a series of workshops that will help you develop the skills you need to study effectively and improve your marks. Places are limited, so to book a place, please email Margi Rawlinson at rawlinsom@edgehill.ac.uk with your name, student ID, course and year. All workshops will be from 1pm – 2pm, in Room B105 in the Business School (opposite the library). Wednesday 2nd February: What makes a good assignment?